Born in Minsk, Belarus to a family of professional musicians, Kyril Zlotnikov began his studies at the Belarusian State Music Academy with Prof. Vladimir Perlin. He continued his studies in Israel with Prof. Uzi Wiesel and Hillel Zori, completing his musical education under the direction Prof. Michael Khomitzer in Jerusalem Rubin Academy of Music and Dance. While a student, Kyril Zlotnikov participated in master classes and courses with such prominent musicians as Isaac Stern, Yo-Yo Ma, Natalia Gutman, Boris Pergamenschikov, Aldo Parisot and Georgy Kurtag. Since 1991 Kyril Zlotnikov was a recipient of a scholarship for musical achievements from the America-Israel Culture Foundation, won prizes in many contests including the Clairmont Competition, the Braun-Roger Siegl Competition, the Pierre Tarcali Prize is the most recent one. He is a founding member of the recognized for its artistic creativity, one of the most dynamic and exciting young quartets currently performing - The Jerusalem Quartet. The musicians have been giving multiple performances all over the world and become the Israel's leading string quartet. Since 2002 the Jerusalem Quartet records exclusively for Harmonia Mundi. Along with his extensive chamber music appearances Kyril Zlotnikov has performed and been broadcast as a soloist with internationally renowned orchestras, such as the Israel Philharmonic Orchestra, Jerusalem Symphony Orchestra, the Ludwigsburg Symphony Orchestra, The Gulbenkian Orchestra, West-Eastern Divan Orchestra, Jerusalem Camerata and enjoys artistic collaboration with acclaimed conductors including Daniel Barenboim, Zubin Mehta, Pierre Boulez, Lawrence Foster, Asher Fish, Simone Young. He has a wide repertoire covering the important cello works of the baroque, the classical period, romantic and the contemporary music. Kyril Zlotnikov is a regular guest at major chamber music festivals such as the Proms Festival, the Bartok Festival, the Vancouver, the Menton, the Ravinia "Rising Stars", the Schleswig-Holstein, the Jerusalem and the Scwetzingen Festivals. A keen recitalist and chamber musician, Zlotnikov has shared the stage with the foremost artists of today such as Daniel Barenboim, Jessye Norman, Pierre Boulez, Elena Bashkirova, Mitsuko Uchida, Natalia Gutman, Tabea Zimmerman, Miriam Fried, Hagai Shaham, Michael Tree, Asher Fish, Nikolaj Znaider, Lang Lang and Richard Stoltzman. 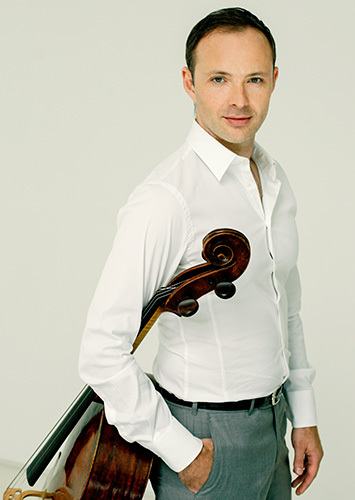 Since 2003 Kyril Zlotnikov has been a principal cellist and a teacher of the cello group at the "West-Eastern Divan Orchestra" under Maestro Daniel Barenboim. He also frequently takes part in special projects and tours of the Berlin Staatskapelle Orchestra as a principal cellist. Zlotnikov has recorded the complete Mozart piano trios with Maestro Daniel Barenboim and violinist Nikolaj Znaider. The two CDs were released by EMI in April 2006.